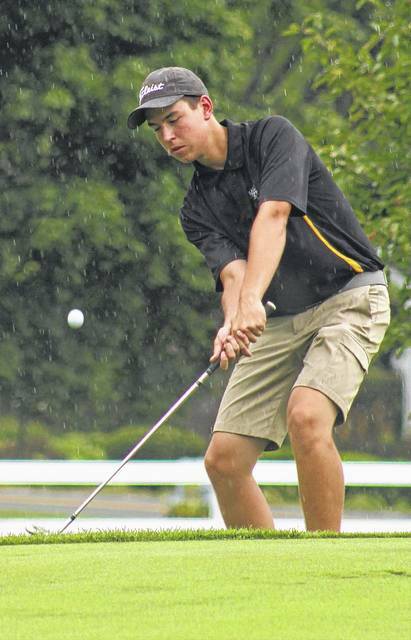 Despite the rains that fell Tuesday, the Washington Blue Lions and Miami Trace Panthers were able to compete in their nine-hole Frontier Athletic Conference golf match at The Greens. The Panthers won with a team score of 198 to 205 for the Blue Lions. Washington’s Tyler Rood shot the low round on the day, capturing medalist honors with a 44. Tyler Eggleton led the Panthers with a score of 45. Also for Miami Trace, Hayden Walters, 49; Cameron Carter, 52; Drew Batson, 52; Brett Lewis, 62 and Trenton Crawford, 66. Also for Washington, Ty Rose, 49; Brock Morris, 55; Gabe Arazo, 57 and Brice Cartwright, 59. Washington will host McClain Wednesday and will play Chillicothe Thursday at The Greens. Miami Trace will be back in action Thursday at Buckeye Hills, taking on the McClain Tigers. Washington’s Tyler Rood watches the flight of his tee shot during a Frontier Athletic Conference match against Miami Trace at The Greens Tuesday, Aug. 29, 2017. 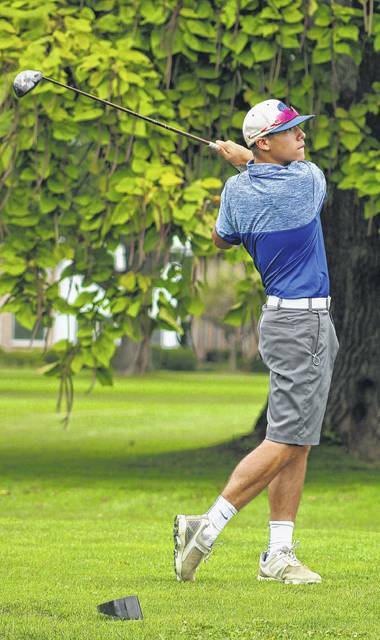 Rood earned medalist honors with a 44.
https://www.recordherald.com/wp-content/uploads/sites/27/2017/08/web1_Tyler-Rood-Blue-Lion-golf-8-29-2017.jpgWashington’s Tyler Rood watches the flight of his tee shot during a Frontier Athletic Conference match against Miami Trace at The Greens Tuesday, Aug. 29, 2017. Rood earned medalist honors with a 44.